Cyber criminals all over the world are having a gala party right now; and India is the playground of this party. In a recent report by cyber security major Symantec, it has been revealed that in the period between July 2012 to August 2013, Indians have collectively spend $4 billion or Rs 24,000 crore to fight cyber criminals and protect their systems from their malicious intent; which is 8% more than last year. This rounds to about $207 average direct cost per cyber crime victim inside India. Globally, the total cost of fighting cyber crime is $113 billion or Rs 6,78,000 crore, with an average direct cost of $298 per cyber crime victim. Indians constitute 11% of all cyber victims globally which is alarming. This report has been compiled using the self-reporting experiences of more than 24,000 adult Internet users spread across 24 countries out of which, around 1000 users were from India. The line between work and play is being blurred as 66% Indians use their smart phones for both work and personal use. And this has resulted in an explosion of cyber crimes specific to smart phones and tablets. The report states that 63% of all smart phones users in India have experienced one or the other form of cyber crime and alarmingly, 47% of smart phone users are not aware that security solutions for smart phones exists! As both work and personal files are stored in the same device, the impact of cyber crime is even more evident now, compared to past. In another related report, cyber security firm Quick Heal announced that a new form of malware, called CryptoLocker is playing havoc with cyber security all over the world. Reportedly, around 500 new incidents are being detected every day, pertaining to this new form of cyber threat. 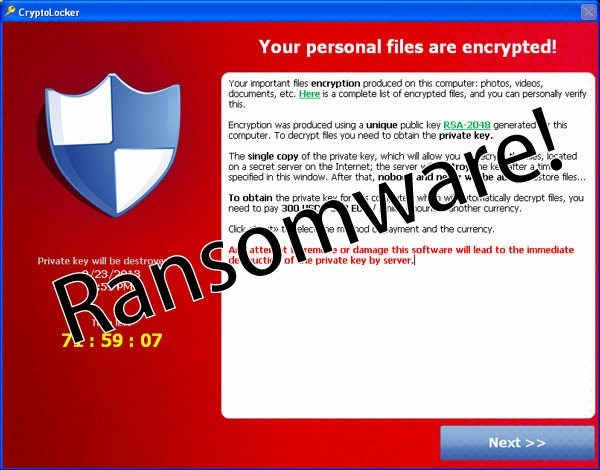 Once attacked, such type of ransomware targets individual users rather than corporate ones and the demand of ransom is normally executed via online payment mediums such as Bitcoin, UKash, Paypal, MoneyPak etc. The most common platform for spreading this new menace is social media sites and emails. Not surprisingly, even smart phone users are experiencing this ransomware, wherein infected applications are downloaded which encrypts all information present inside the device. Once a user tries to open a file, a pop-up appears which demands ransom to get the private key to remove this malware. – Take regular backups of your data on smartphone; Tablet; PC and Laptop. This will help to recover files in case you decide to format the system. – Always use a multi layered anti virus system and never forget to update it. – Don’t open unknown or malicious looking email attachment; links shared on social media sites or download unknown applications on smart phones. – Use alpha numeric and special characters in passwords, and keep on changing them frequently. Have you experienced any such cyber attack? Do share your security tips to fight these cyber menaces and to protect one’s computer and smartphone.